Why Economic and Community Development? REALTORS® are instruments of economic & community development and vested partners in the promotion of our region. Central Indiana is a great place to live and work – and we want everyone to know. For this reason, REALTORS® are involved with organizations that shape decisions on housing and the economy, such as local chambers of commerce, local economic development organizations (LEDOs) and city governments. Through its economic & community development initiatives, MIBOR REALTORS® work to improve quality of life for the people who already live and work in our 13-county service area and additionally for prospective residents who are looking to call central Indiana home. 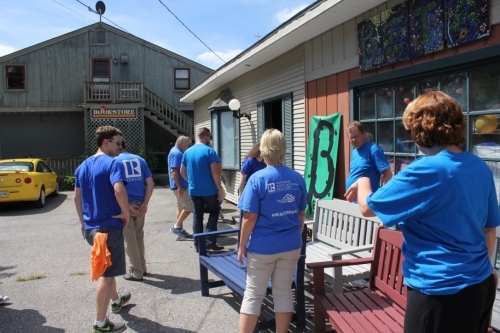 Earlier this year, MIBOR REALTOR® Association (MIBOR) convened a group of city planners, elected officials and community leaders from across the region for a two-part walkability workshop in Franklin, Indiana which is located 25 minutes south of Indianapolis. MIBOR was one of the first local associations to secure a Smart Growth grant from the National Association of REALTORS® for this project. NAR initiated this effort because walkable communities reflect the basics of placemaking, creating and establishing places where people want to live and visit. These attributes are vital to the success of the real estate community. Read more. How Can We Help Your Community? Placemaking Grants Available. If you’ve ever noticed how a few benches make a public square more inviting or how a community garden makes a neighborhood feel more livable, then you’ve appreciated placemaking. Placemaking is a global movement that helps citizens transform their underused public spaces into places that highlight local assets, spur rejuvenation, and serve common needs. Examples range from playgrounds and public gardens to bike trails and sidewalk seating. Placemaking can mean many things to many people. There is no standard model in use, but it usually means creating an enjoyable public space where the community can gather. Places that reflect this concept include pedestrian plazas and walkways, parks, community gardens, walking paths, and bike trails. These projects can include the whole place or an amenity, such a fountain, a mural, seating, landscaping, or swings. Piggybacking on a major project can be an excellent plan. For example, if a new community facility is being built, such as a library, park, or train station, consider creating a gathering place outside the building. Does your community have an idea for a placemaking project? Do you need help funding the idea? If so, MIBOR has a limited amount of placemaking grants available. If you have a project planned and would like to be considered for funding, please contact Zach Churney, MIBOR economic and community development liaison at 317-956-5258 or zacharychurney@mibor.com. Recent Placmaking Grants - in Action! REALTORS® and city and community partners gathered in Nashville, Indiana to break ground on a pocket park enhancing underused space in the lot behind the Brown County Art Guild and the BETA Teens facility, which houses an after-school program for low-income youth. Click here for more details on this awesome project! Fortville, Indiana has seen a "flourishing of new businesses" on its Main Street, which means traffic—foot traffic. Now, with the help of a placemaking micro-grant from the National Association of REALTORS®, and the efforts of the MIBOR REALTOR® Association, what was once an alley has become a pedestrian walkway and community destination.